Robert Tucker was born in Yeovil on 31 January 1802, the son of Robert Tucker and Margaret née Messiter of Barwick. In the 1832 poll book Robert Tucker the younger and his father Robert Tucker the elder were both listed, separately, as living in Hendford; Robert the younger by virtue of a freehold house and Robert the elder by virtue of freehold land. Robert the elder died in Yeovil in the autumn of 1841 and Robert the younger placed a stained-glass window in memory of his father at the east end of Holy Trinity church. Robert Tucker became a prominent glove manufacturer and lived at Hendford Lodge. In 1839 a campaign started to open a day school under the patronage of the Church of England and plans were made for a new school building in Huish. In 1821 and 1822 he was a Churchwarden of St John's church, serving with John Ryall Mayo and he was re-elected in 1830 and 1832 and served alongside Charles Greenham. He was also a member of the Vestry. During 1837 Robert was one of the founders of the "Yeovil Coal and Potatoe Charity" with the intention of aiding the second poor of Yeovil. Robert Tucker, by now retired and a Town Commissioner, acted as secretary for the campaign and gave to the ministers and churchwardens of the parishes of Yeovil and Preston a garden plot adjacent to the Calvinist burial-ground as a site for the school. In April 1846 the National Day School opened in Huish for the education of children of poor parents "in the principles of the Church of England". However he firmly opposed exclusively denominational teaching at the school, insisting on "daily study of the Bible but no catechism and no requirement to attend a particular Sunday School". He ensured that history and geography were included in the curriculum, and persuaded the committee to reject a suggestion that the time accorded to singing was too much. He was married to Sarah, daughter of banker Henry Whitmash of Whitmash & White. However Sarah died on 3 April 1831 aged just 27. They had four daughters but only one survived to adulthood, Sarah Anne Whitmash Johnston, who died in Brighton, Sussex, on 28 November 1853, aged 25. By the 1851 census Robert was listed as a widower aged 49 and gave his occupation as "Landed Proprietor". 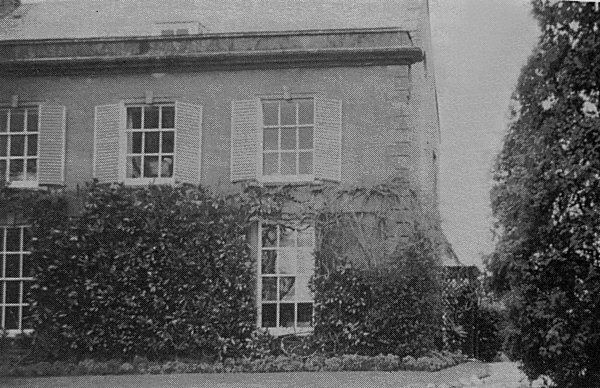 He was living at Hendford Lodge with two domestic servants. The only difference in the 1861 census was that he described his occupation as "Magistrate for the Borough" (he was appointed as a Borough magistrate in 1852). He was still living at Hendford Lodge with a housekeeper and two other servants. He entered local politics in the 1840's and was appointed as a Town Commissioner. After 1841 he became the permanent Vice-Chairman. He lent money to the Commission on several occasions (£300 in 1849 - in excess of £300,000 at today's value) and served on the special Commission to take over markets and build the new Town Hall. 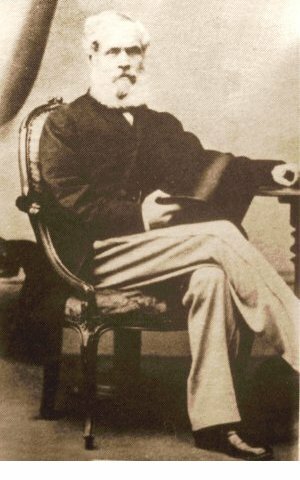 He supported the campaign for municipal reform in Yeovil and although he was not on the new Borough Council formed in 1854, he was the only non-member to be elected Alderman. He served as mayor of Yeovil from 1858 until 1860. Robert Tucker died at Hendford Lodge on 27 October 1867, aged 65. He was buried in Yeovil cemetery and the memorial plaque to him, Sarah and their daughter, in St John's church, is shown below. Robert Tucker Jnr's signature against the Vestry minutes of 3 March 1831. 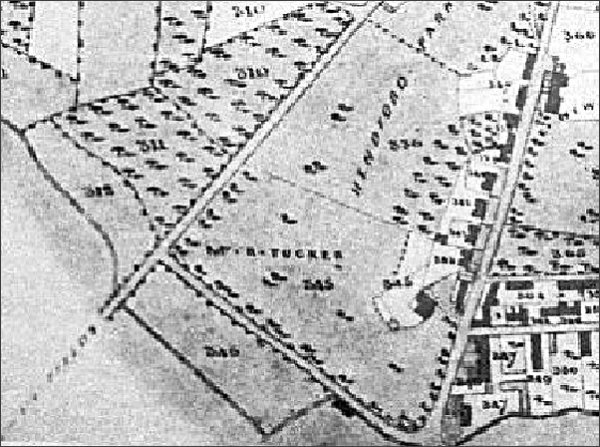 The Yeovil Tithe Apportionment of 1846 and the Preston Plucknett Tithe Apportionment of 1848 show that Robert Tucker had extensive land holdings in both places as tabulated below. His total acreage held in Yeovil was 46a 0r 13p while the total acreage held in Preston Plucknett was 105a 5r 9p. Bidder's map of 1843 shows West Hendford running from top centre towards bottom left before petering out, Hendford runs from top right corner to bottom right and Horsey Lane joins the two at bottom centre. Robert Tucker's land, including his house Hendford Lodge, is marked 'Mr R Tucker' and occupies all the land between West Hendford and Hendford. Hendford Lodge was Robert Tucker's home for many years. It was demolished in 1973. 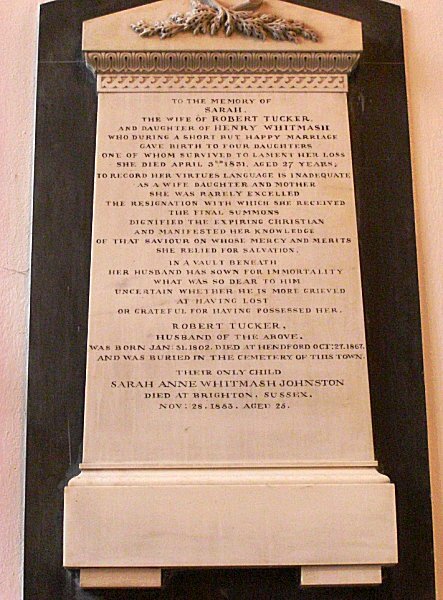 The memorial tablet in St John's church erected to the memory of Robert Tucker and his wife Sarah née Whitmash.